I was recently asked my opinion about how America might move forward at this point in history, when our society sometimes seems fragmented to the point that the various shards reflect separate realities. The short answer is “democratically.” But that answer leaves out some essentials. Voting rights do need bolstering, but more importantly, the society which casts those votes needs to be understood. And that society is multi-ethnic. These days, some people talk about “multiculturalism” as if it were a modern philosophy which we can adopt or reject as we choose. Actually, that choice was made four centuries ago. Right from its inception, the United States has incorporated a multiplicity of cultures from at least three different continents. It’s tradition. So the only genuine options nowadays are whether to embrace this continuing reality or ignore it. For me, America’s diversity has long been its source of strength, despite the inevitable disconnects that may occur between groups. So the way forward begins with an appreciation of our multiculture’s structure and its strengths (which are many), because that’s the base upon which all else is built. First, though, one must be clear what “culture” is in the first place. The term “culture” can be confusing, because its meaning has varied through time. Centuries ago, it meant “to make something grow.” It’s still used that way in words like “agriculture” and “cultivate.” Later, “culture” came to mean “cultivating the mind,” such as learning to appreciate music, the arts, poetry, etc. It still is commonly used in that sense. Then about a hundred years ago, the field of “anthropology” was invented and “culture” came to refer to the physical objects that supposedly expressed an ethnic group’s way of life. These cultural objects were a little like fashion accessories in that they could have been produced one way or another according to taste and available materials. When is it proper to look somebody in the eye? What is the proper role of an aunt or uncle in a child’s life? Do I treat my honored guest to a restaurant meal or to a meal at home? Is it proper to ask the person you just met where they’re from? How about their salary? Is it proper to receive gifts from friends on your birthday, or should you be the one to give gifts to those friends? How binding is a contract? How late must you be to owe somebody an apology? Such questions get different answers depending upon the culture. The above paragraph uses the word “proper” advisedly. People within a culture will characterize the answers to such questions as being “correct” or not — “common-sense” rules. So, for example, there is a “correct” or “proper” physical distance between people having a conversation, depending upon their relationship to each other. Nobody teaches that “separation distance” explicitly, but people pick up on it implicitly as they grow up in a particular culture. Again, unless people are forced to interact with foreign cultures which prescribe different separation distances, they assume that their own culture’s distance is “proper,” a universal standard. This assumption that one’s own cultural rules are universal (when in fact they are relative) is called ethnocentricity. Every human is subject to ethnocentricity. I’ll return to that idea below. Professor Charles Irby at UC Davis first brought the importance of ethnicity and culture to my attention, back when I attended college there. But he always cautioned us that, however one measures, people within a culture vary more than one culture varies from another. That is, any particular culture includes individuals who would answer the previous section’s questions differently than what’s typical for that culture. So the attention to cultures that I advocate should ultimately serve as a bridge to the individual human beings who live within them, who are never as easy to categorize as we sometimes might wish. Interestingly, the only person outside Professor Irby’s class whom I ever heard express that same opinion about variation within cultures was a young Japanese woman whom I met at a linguistics school, even though Japan itself is not really a multicultural society. How did she know? When I first began teaching in China, I enjoyed how so many young women (the university students) wanted to flirt with me. At last, a whole category of people was acknowledging my good looks and charming manner!! Alas, though, my own ethnocentricity had led me astray. The “proper” separation distance in a normal Chinese conversation is simply closer than it is in my own culture. I assumed that the students’ nearness expressed a special meaning like it might have done back home. My mistake! Well, eventually I got used to it and life seemed normal again. Some things, though, I never could get used to. For instance, Chinese acquaintances often greeted me with “Have you eaten?” In California, that would have meant a lunch invitation. In China, it’s just what they say instead of “How are you today?” And no, this doesn’t mean that Chinese culture values tasty food while my own culture cares more about people’s overall health. So going forward, we who take part in our American multiculture must figure out how to work with the other groups while remaining true to ourselves. We cannot just interpret the actions of other groups at face value, because that’s often just the face of our own ethnocentricity. And of course, the ultimate goal is to work more effectively with individual persons. Along these lines, it not only helps to study our other cultures, it helps to become more aware of one’s own culture. A few days ago, I read an interesting article about child rearing in the Inuit culture of Canada’s farthest north. For much of the year, when the weather is ice cold, the Inuit live inside, in very close quarters, so they’ve developed strategies for keeping anger under control. The article explains how they pass these coping skills onto their young children. These child-rearing skills seem quite different from what I’ve observed here in America. Should all Americans adopt them? Not necessarily. People who don’t live so close together may not need them. But the Inuit’s culture could provide options that other people might find useful, so long as they don’t dismiss them as outside the boundaries of “common sense.” This is the power of ethnic diversity — it increases the resources available to all. Biologists always stress that in diversity there is strength. It’s true for every population of living things, not just for humans. Inbreeding makes for weaker organisms, and not just for old European royalty. But one never knows which individual in a diverse population will carry the day for all. Take the example of German entrepreneur Oskar Schindler who used his famous list to save 1200 lives during World War II. For most of his life, Schindler was an irresponsible womanizer with a dysfunctional life. But his heart was good. In wartime, he could leverage his few real skills into a momentous and heroic deed. After the war ended, his life inevitably disintegrated. He wouldn’t have even lived to age 64 had not the people whom he’d saved sent him money every year. So this individual who, in normal times, needed assistance just to survive, was a hero in extreme times. That’s the value that biologists find in diversity. So maybe that random homeless person seen on the streets is an Oskar Schindler in waiting. What’s true of human individuals is also true of human cultures. You never know when an obscure culture might carry the day for all. Sometimes it’s not the individual culture that triumphs, but an interaction among cultures. A hundred years ago, New Orleans’s dominant cultures included Creoles, Cajuns, and Africans, as well as an English-speaking elite class. The African Americans drew upon the cultural resources of all the other groups in fashioning jazz music. It all came together in the genius of Louis Armstrong. But jazz can be more than just a musical style. It’s a method of organizing group interactions in order to promote each member’s spontaneity and creativity. Its main innovation is a leadership role (called “the soloist”) which passes from one member to another during the performance. As each group member takes a turn as an improvising soloist, all the other musicians shift their own improvisations to supporting roles. Specific structures such as chords and scales and rhythmic forms are imposed by tradition, yet remain flexible enough to maximize the musical inventions. This form of group interaction also works outside of music. In an elementary school, it can structure groups of students. In my own classroom, the rotating leadership model worked particularly well for creative arts activities like “writer’s workshop,” but it could be adapted to any curricular area. It would probably also work in a small Silicon Valley start-up, or a university research lab. It’s not the only way to arrange such small groups, but it should be considered when creativity must be maximized. And if not for Louis Armstrong and the ethnic soup of old New Orleans, the option might not have occurred to anybody. Such inter-cultural invention reminds me of our own federal republic. Where did the idea for that organization come from? Some historians trace it back to the Roman Republic or Athenian democracy. Others trace it to Native American federations such as the Iroquois League. Probably it emerged from the intersection of all of these. So going forward, we should remember the benefits of a diverse multiculture, and not just try to shoe-horn everybody into one cultural form. The British colonies in America were set up by a United Kingdom which was itself multi-ethnic, despite its small size. So no wonder British America was multi-ethnic, right from the get-go. In fact, the UK’s multicultural strength may help explain how such small islands could found one of the largest empires in history. And it might help explain how the British held onto North America’s heartland when other colonizers couldn’t. In the beginning, different British colonies were founded by different British cultures. New England and the American lowland South were founded by Anglo-Saxons from Southern England. Pennsylvania was settled from the old Danelaw, an essentially Scandinavian cultural area in central-east Britain, and Appalachia was mainly settled by Scots (who differ from English), from either the Scottish lowlands or from Northern Ireland. That’s three cultures right off the bat, without even considering the Celtic cultures of Ireland, Wales, Cornwall, and the Scottish Highlands, all of which eventually joined British America. Other European countries — Sweden in Delaware, and Holland in New York — founded colonies which eventually turned British. The Dutch were particularly open to diversity. When New York City was still Dutch New Amsterdam, it famously included significant populations of Jews, Dutch, Danes, English, Flemish, French, Germans, Irish, Italians, Norwegians, Poles, Portuguese, Scots, Swedes, Walloons, and Bohemians. Today’s New York still boasts some of the greatest ethnic diversity in America. Native Americans and Africans joined this ethnic mix, in large part unwillingly, but joined nonetheless. Like the rest, they didn’t forget their cultures when they joined in. In fact, it may be more accurate to say that they couldn’t forget their cultures. Again, cultures endure. People hand them down through the generations just like they hand down native languages — through example and experience, and in large part subconsciously, not through direct instruction. Professor Irby used to say that a culture’s foremost expression is its language. Both language and the other aspects of culture (as indicated by that group of questions above) facilitate communication, group organization, emotional expressions, technological developments, and much more. So examples of how languages endure can show how cultures endure. Britain’s Anglo Saxons, four centuries ago, spoke a form of modern English differing little from today’s. This language was much like that of William Shakespeare, who was alive back then. It survives pretty much intact in the isolated dialects of the inhabitants of Chesapeake Bay as presented in the classic TV series The Story of English. Four centuries is a pretty long time. Other aspects of a culture are just as enduring. They persist, even when surrounded by other cultures, because people are most comfortable with those who share their culture, just as people are most comfortable with those who share their language. Both of these motivations encourage people to maintain their ethnic groups. This multiplicity of groups results in a United States that is culturally not a melting pot but a salad bowl, another concept that Charles Irby first pointed out to me. 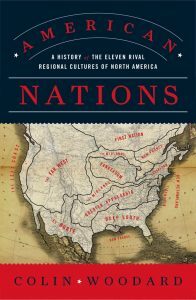 Some authors, to demonstrate this inter-generational cultural persistence, have identified several geographically distinct North American cultural regions (called “nations,” a word that usually refers to an ethnic group) whose dominant cultures descend from those which first settled each region. One such system appears in American Nations by Colin Woodard, who plots out eleven regional nations (that is, dominant cultures) in North America. His book is reviewed here, at the Independent Newspaper. The cultures of these eleven nations may not remain exactly as they were when planted, but the ancestry is clear. Again, a culture’s endurance comes from its transmission through subconscious training, and its reinforcement through group attraction. Culture is not baked into people’s DNA. Some people, though, believe otherwise. A Chinese friend in China regularly picks out the flaws in China’s mainland culture and despairs of them ever improving because he feels that culture comes from the people’s DNA. The two of us have still not finished our argument about it. Another example from China involves my friend Lonnie’s American friend, raised in Taiwan to speak Chinese natively. He later moved to the mainland, where his new housemaid understood none of it. He suspected that the woman’s comprehension was inhibited by the common Chinese belief that Europeans are genetically incapable of speaking Chinese, and therefore what she heard could not possibly be Chinese. So he pointed at his face, and shouted (always in Mandarin) “Pay no attention to this nose! Just listen!” The shocked woman forgot not to understand him, and they experienced no further comprehension problems. Some Americans also subscribe to the DNA theory, but not quite the same way. I’ll come back to that point later. Meanwhile, Charles Irby used to joke (sort of) that if a human baby were raised by a herd of sheep, then that baby would “inherit” sheep culture. So going forward, the durability of our multiculture, from its founding to the present day, and into the future, demonstrates that it’s worth taking into account. Cultures can change or evolve, despite their stability, particularly through contact with other cultures, as again demonstrated in the history of the English language. As we trace it back in time, it changes very little until A.D. 1066. Before that date, English is quite hard to understand, though much of the same vocabulary was already present. After that date, it’s much more understandable. So what happened in 1066? French-speaking Vikings (the “Normans”) invaded and conquered England, and remained there as rulers. So Old English combined with French to form a double-branched language, with English still structuring the core. The two branches still persist, almost a millennium later, giving modern English perhaps the largest vocabulary of any language. Another triumph of cultural diversity! Similarly, newly-arrived cultures in America can evolve pretty quickly where they meet the American educational and legal systems, as well as the English language, while retaining much of their traditional cores. But the old culture is used in an American way, resulting in a double-branched culture, like the double-branched English language itself. Thus, when I visited China with a group of second-generation American-born Chinese people (known as “ABC”s) they had insights into Chinese thinking that I lacked, yet they were often as mystified by China’s society as I was. So going forward, we can identify, strengthen and disseminate the aspects of the American multiculture that foreign cultures most easily assimilate and those which they most need for participating in society, while giving them space to maintain their traditional cultures as a “second branch.” I’ll come back to this point. Depending upon the location, the dominant American cultural groups are not necessarily English. 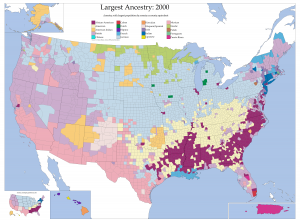 This map, produced by the US government (click it to see it full sized), indicates which ancestral nationality was claimed most frequently in each and every US county. The dominance of Latino culture in the Southwest is no surprise, but look at all the Germans! The dominant culture is rarely an actual majority, but a plurality. Only one county has a plurality of Chinese – San Francisco County, of course. The map’s variety hints at the diversity beneath each plurality — multiple cultures, planted amidst each other, that persist due to the natural staying power of cultures. America’s cultural complexity ramped up quickly in the nineteenth century because, until the Immigration Act of 1924, the borders were essentially open. (except for the Chinese, who were excluded by law in 1875 and 1882). Prior to that, officials may have recorded who came and went, but (except for Asians) they didn’t generally try to stop them. Not every one could become a citizen, but they could mostly stay anyway. So I know that my Swedish grandfather eventually became a US Citizen, but I have no idea if my immigrant grandmothers ever did. All three of them had come to America before 1924. This accelerating complexity didn’t end in the nineteenth century. My old Hayward School District is much smaller than a county, with 21,000 students. Yet those students speak almost as many minority languages as in all of China! In fact, China provides a useful contrast with America. China likes to play up its 56 ethnic minority groups. It sounds like a lot. But all together they comprise only 7 or 8 percent of the population. And they mostly live in out-of-the-way locations, around the periphery of the country, or out west. And China is working to sideline many of them even there, forcing them into re-education camps, basically to eliminate their ethnicity, while boatloads of ethnic Chinese move west to dilute their population. (To be fair, America also has a history of attempted ethnic elimination through dilution and reeducation, particularly concerning Native Americans, whose land was coveted). Many Chinese assume that the rest of the world’s countries are just as pure. My Chinese students would often say, “The Chinese people think thus and so. What do Americans think?” That statement makes some sense in China, but the question makes little sense in America, where different groups frame issues different ways. 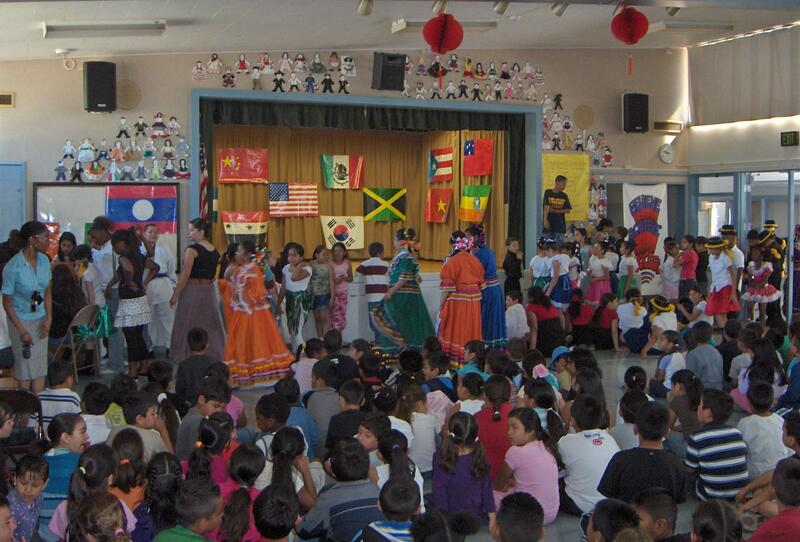 Such an expectation of national purity caused one Chinese student to be shocked by this picture of a show at my old elementary school in Hayward, many many years ago. Another example of monoculture that I experienced might be Ireland before it joined the EU. Just about everybody there was Irish because job scarcity discouraged immigration. China and pre-EU Ireland may not seem relevant to the multicultural United States. However, the Chinese aren’t the only ones who presume a single American majority culture. Many Americans do, too. Ethnocentricity, again, leads people to believe that their own culture is universally “normal” or “proper.” Thus, they may ignore or misinterpret the features of other cultures. Again, language can be used to model this process, though rather artificially in this case. The word “familiar” occurs in both English and Spanish, but with different meanings. In English, it’s something well known and routine. In Spanish it’s one’s blood relatives (family). But ethnocentricity might lead an English speaker assume that it can only mean”Well known and routine,” regardless of the language. In that case, Spaniards seem to use “well known and routine” in odd ways, which may in turn lead the English speaker to falsely impute various values to Spanish culture. So, to the English speaker, a Spaniard who frequently mentions “familiar time” isn’t spending time with family. He’s just stuck in the “well known and routine.” And that must mean, in turn, that Spaniards are unadventurous and fearful people, clinging to old habits. Of course, Spaniards are not like that at all, not even in this crude and artificial metaphor. It’s a misunderstanding caused by ethnocentric assumptions. This kind of misunderstanding occurs between cultures all the time, such as my above-mentioned assumptions about separation distances and lunch “invitations.” Thank goodness I waited to learn the truth about them, and didn’t assume that they indicated some character flaw in the culture. The lesson to be drawn going forward? On closer inspection, cultural “differences in values” often turn out to be the same old common values, just expressed in different ways. Probably the principle reason for a belief in a majority American culture is that some American cultures are more privileged than others. The elites, whether teachers, managers, heads of state, or businessmen, tend to hail from a limited number of related cultures, since “birds of a feather” are more comfortable together. In contrast to the previous example (number 2 above), the American elites’ “cultural island” seems not to stand apart from those around it. That’s because those other cultural groups adapt to appear more like elites (at least superficially), usually for economic reasons. So a Chinese elite person accurately observes that his surrounding society shares his culture. An American elite person observes something similar, but it’s an illusion, not only maintained by his own group’s ethnocentricity, but by the other groups who have become bicultural. 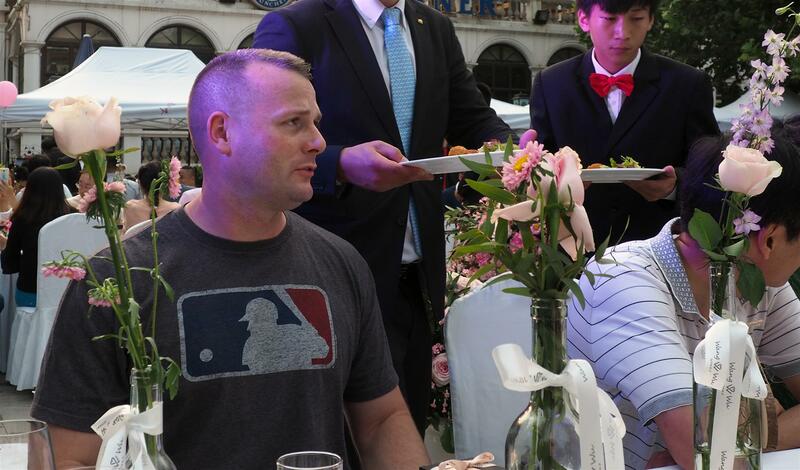 Two examples of Americans that I met in China are illustrative. I once attended a wedding reception in China. I sat with some employees and clients of a Chinese company that I knew. The group included one client from Kentucky. I remarked that he must not come from the Appalachian part of the state (the mountain part), since he didn’t have that accent. “Oh, y’ mean lack this?” he answered. It was like the sudden emergence of Li’l Abner or Jed Clampett. Andy Taylor? He carried on with his “mountain talk” for a while, ending with “If I taowk lack that . . . nobody takes me seriously.” No doubt so, unless he was back home in Appalachia. In the business world, he changes his language and adapts his cultural appearance to accommodate business elites. For the curious, there’s a video about the relative status of Appalachian culture here. And another video provides more details of the Appalachian version of English here. A great example of Appalachian English is provided by the well-known seven-foot-tall Appalachian storyteller Ray Hicks telling a traditional “Jack Tale.” Ray also appears (with subtitles) in this wonderful PBS documentary about Appalachian arts. He also appears in this other wonderful PBS video about the Scottish language and how it evolved on its journey through America. This Kentuckian contrasted strongly with another American client of that same Chinese company, whom I met at a different luncheon with those very same employees. The conversation was held in English, and he mused aloud that maybe English should supplant the world’s other languages, in the interest of more efficient communication. Everybody at the table waited for him to laugh at his own joke. But time dripped by and it gradually dawned upon the rest of us that he was serious. I never asked, but can pretty much guarantee, that this fellow was not from Appalachia, because an Appalachian would have had more perspective. Again, the less-privileged groups trade what’s “proper” to them for what’s “proper” to someone else, when interacting with them. They still maintain their own culture, because it’s hard not to. Is the situation frustrating? Maybe not, if such adaptations have been incorporated into their own cultures over the generations. But going forward, it’s helpful to recognize the reality of the American multiculture and not bind ourselves to the elite’s vision of a majority culture. This would ensure that all our citizens fully participate in society. It’s also helpful to recognize the elite’s point of view, which causes some people to ignore the multi-ethnic reality. It’s natural, then, for them to view “multiculturalism” as a new movement, instead of a long-standing tradition. We need to build bridges to these people, too, and take their concerns seriously. By the way, none of this argument means that “standards” aren’t useful. They are. But how are they characterized? Actually, China, for all its “standards” mania, provides a good example with the name for its standard language. It’s not “proper” language, but “common language,” a term which emphasizes its practicality without implying any moral values. In defense of ethnocentricity, cultural differences can be frustrating, as I found out in China. Two people who speak different languages can at least perceive that the languages are different. An ex-pat might not even perceive his differences with the surrounding culture at first. Instead, ethnocentricity grants a “honeymoon” period, when he experiences even more freedom from the consequences of his social actions than he’d have back home, especially if he’s in China where the people readily forgive the foreigner for not understanding what he’s doing. But that’s the teachable moment. Of course, nothing’s wrong with “these people.” That’s obvious in China, a country that’s made such great strides in recent years. Instead, it’s time for the foreigner to finally loosen his grip on his own culture, and get with the program. The lesson for America is that friction between cultures can be real and significant. So going forward, to maintain the advantages of a diverse society, we should understand its component cultures and acknowledge them, in order to further intercultural communication and smooth the inevitable frictions that occur. After all, maintenance is a common task. We maintain vehicles, houses, corporate structures. etc., so why not our multiculture, when it offers just as many advantages? Race Spaces – What is Race? As mentioned above, Americans (I think) don’t directly impute cultural characteristics to DNA, like my Chinese friend did. But they do (at least, many do) impute cultural characteristics, abilities, or “values” to DNA through the idea of “race.” This idea represents just one of many definitions of the word “racism,” by the way. So if we are to move forward, we must reckon with the American idea of race and how it conflates with culture. Is race real, by the way? For many years, an old book, The Story of the Irish Race, sat on my shelf. It’s actually a fairly conventional history of Ireland, published a hundred years ago. It calls the Irish a “race.” Indeed the English had long viewed the “Wild Irish” as organically different from themselves. Are they? Science says “not really.” When DNA sequencing first became practical, scientists found no difference at all between the Irish and English populations. More recent studies, mainly designed for dealing with genetic diseases, have teased out some differences at essentially the extended family level, but to me, none of them establish anything approaching a race, a subspecies. In fact, the evidence I’ve seen indicates that all modern humans belong to a single race of a single species, with minimal variation between populations. Any other races died out long ago. These were the Neanderthals, the Denisovans, and maybe some undiscovered others. The point of all this: Racial groups may seem to be determined biologically, but they are not. They are constructed socially, according to taste, by picking and choosing different assortments from a panoply of superficial human traits. I used to favor the racial system where Finns (like my grandmother) and East Asians (like my Chinese friends) all belong to the same “race.” But that’s sentiment, not biology. Americans traditionally define races by skin-deep traits like skin color and nose shape. So the white-skinned-and-bushy-bearded Ainu of Japan go with Europeans (whom they resemble) though their closest actual relatives are dark-skinned lightly-bearded East Asians. This American version of race also splits Finns from East Asians. So I don’t much care for it. Actually, though, I don’t much care for any race system. So ethnic cultures are more consequential than race for understanding human societal groups. Racial systems can be constructed according to whim. Cultures, on the other hand, are durable. They resist change even if people try to change. There is one important caveat to this negation of race as a valid factor in human population groups. Since many Americans put stock in the reality of race, this belief itself has a tremendous effect on our society, obviously disadvantaging some, but even affecting those whom it doesn’t disadvantage. So it makes me feel trapped. Ideas of “Race” were planted in and around me, in large part subconsciously, as part of my culture growing up. So I’m stuck with them, and to move beyond them requires effort. How did “race” get to be so important in America, even though it’s less real than ethnicity? The elite ethnic groups in America ran into a problem early on — that they were a minority in their own country. (The Founding Father James Madison called the richest of them the “minority of the opulent”). But in a democracy, their privileges could be voted away by a majority. So to remain elite, they needed to make common cause with other groups. They eventually turned to the idea of race (though they hadn’t invented it) and established a “whiteness umbrella” of various ethnic groups to form a governing majority, which they expanded as needed to maintain its influence. This measured expansion was not a conspiracy, at least not in the normal sense of that word. Nobody gathered in smoke-filled rooms to plan out a national strategy. They just fell into it because each expansion felt right at the time. Nor is it the only reason that race moved into the heart of American society. Slavery is another obvious reason. The Irish and the Italians are typical examples of the expanding umbrella. Originally outside it, they were invited inside, perhaps even begrudgingly, to stand against “non-white” groups. In fact, I’m old enough to remember the final complete acceptance of Irish Catholics when John Kennedy was elected president. Those under the “whiteness” umbrella didn’t necessarily lose their authentic ethnic identity. The Kentuckian in China is one example. My own family is another. In fact, I never fully appreciated the strength of cultural continuity until I actually visited Sweden and found that the people there “felt” a lot like the second- and third-generation Swedish-Americans of my childhood community. They didn’t seem exactly the same, but the relation was unmistakable. Before then I’d thought that that part of my family was just odd. Some “white” people whom I’ve known do complain that they have no ethnic culture — they’re just “white.” This sentiment is real, though strictly speaking, it’s not really possible for humans to exist without a culture. But they’ve expressed envy when other ethnic minorities celebrate their own cultures (or the non-English branch of it). But perhaps a trip to their ancestral homeland would demonstrate to them, as it did to me, how much ethnicity survives within them, subconsciously acquired while they were growing up. Sometimes I think that if we’re so invested in racial dominance, maybe we could just rename “White” to “Northern Races,” add the Japanese and Chinese to the crowd under the “umbrella,” and keep dominating for another few decades! Kidding aside, though, I welcome the demise of dominance through “whiteness” or through any other racial or ethnic category, because it will help bring out our country’s unique strengths, which go beyond ethnic identities (while at the same time, preserving them). Going forward, then, we should diminish the idea of race (since it’s not real) and elevate the idea of cultures (since they are very real). We should understand these cultures as organizational schemes, containing much individual variation, and not as value-laden identities. Then we should continue exploring ways to knit cultures more firmly together into a complex American society. That said, America’s false belief in “race” isn’t going away anytime soon, and its consequences are real, and the source of every sort of mischief. But dealing with it directly is a problem beyond what I wanted to write about this time. So, beyond using simple loyalty, how can we melt our salad bowl into a pot whose components function in coordination for the betterment of all, while maintaining their tightly-bound ethnic identities, which can’t be cast off, anyway? One way to “melt the salad” is through the Rule of Law. That not only means the Constitution, but all laws and regulations. Together they operate like guidelines, like the stripes down the middle of roads, which guide everyone to their destinations safely, wherever those are, whatever the vehicle, and however it’s driven. Laws can be written to favor one group over another, so The Rule of Law must be coupled with democracy and minority rights. The push and pull of voting on issues will accommodate various local groups better than any central planner, be they monarchs, dictators, or (for that matter) CEO‘s. So moving forward, we must elevate the rule of law, and promote and secure our voting systems, elevating democracy. None of this happens by itself. The principle alternative to Rule of Law is Rule through Relationships. Such relationships could include personal or social connections, as well as those mediated through money, such as employers to employees, stores to customers, doctors to patients, etc. Often these two kinds of rule will combine, like in community policing. In fact, probably all societies combine both kinds of rule, but in America, laws tend to dominate. In China, on the other hand, relationships dominate. 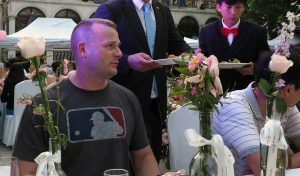 It may be hard for Americans to fathom that such a huge country as China can be held together principally through relationships. But consider the Chinese lady whom I once escorted to our church parking lot about twenty years ago. On the way out there I asked her what she did in China. “You mean China doesn’t have the rule of law? ?” I’d never even considered such a possibility. They did finish China’s new constitution. Still, cultures usually don’t evolve quickly, especially when not challenged by neighboring cultures. So several years later, while living in China, I witnessed many instances where personal connections held sway over rules or laws. Once, a national Chinese newspaper even blasted “rule of law” as a Western concept not appropriate for Chinese society. Well, maybe a dominance of relationships could work well in China, where the culture is relatively pure and people might intuitively understand each other. Maybe. The same spirit that prefers “rule of relationships” to “rule of law” in China can also be found in America, particularly among elites, despite our democratic traditions. Going forward, we must always guard against them gaining the upper hand, since Rule of Law can unite groups, while rule through relationships often separates them through favoritism. America’s identity, viewed from abroad, may seem culturally shallow, like fast cars and fast food and fantasy superheros. Not much meaningful depth there. Same with “convenience marts,” sports as leagues, simple pop music, freeways, stop lights, etc. These are all recent innovations without many roots in traditional culture (except maybe for Thor). But their very shallowness facilitates their accommodation into just about any culture. Thus, they can serve as touchstones, links between cultures. And not just within America. They’ve already spread across the globe. There’s even a McDonald’s in Paris. And McDonald’s is all over China, with some local cultural adaptations. So Chinese customers still use straws for drinking, but some fastidious customers use them as chopsticks to eat the French fries. So going forward, I guess we can continue to rag on fast food, with all its empty calories, but, along with the other shallow features, we should also recognize its inter-cultural utility. I had been blessed with parents who never expressed disparaging opinions about any ethnic or racial or religious group. Unfortunately, other people their age were not always so fair minded. Those disparagements always took the same form. “Those people” were lazy, sexual threats, and criminals who overpopulated the land, ending up as welfare queens. As a youngster, I sometimes wondered “Is it really true?” And then 60 Minutes aired a segment on the violent “troubles” in Northern Ireland between the Protestants and Catholics. As it turned out, those conflicts were not religious at all. They weren’t disputes over Christian doctrine. They were a cultural clash between two ethnic groups, the Scots and the Gaels — who happened to affiliate with two different churches. In American eyes, the Scots and Gaels were both white, the same racial group. So I was surprised to hear some Scottish Protestants disparage “those people” (Gaelic Catholics) with the same labels, word for word, that I’d heard some American whites (who might even have been immigrant Gaels) inflict upon black people. Such intra-racial disparagement logically invalidated any inter-racial disparagements, let alone any religious, cultural, or biological ones. Since then, most such “religious disputes” that I’ve heard about have turned out to be ethnic strife, whether they involved Muslims or Jews in Europe, or Christians and Buddhists in other places. Going forward, when we hear such disparagements, we must call them out for what they are, and reveal them as contentions from the same old class of trouble makers who always like to amplify the natural frictions between cultures (rather than reconcile them), using the same old “divide and conquer” strategies for their own misguided desire to rule. America isn’t the only multi-ethnic country on earth, but the size and numbers of its component groups is exceptionally large. And because it’s okay for individuals to maintain connections with the Old World, even while remaining loyal to this one, America’s multiculture can serve as an international crossroads. In a shrinking world, such cultural intermediaries may prove vital in maintaining global peace and in working out new ways to move forward as a species. This time, the counter-example is France, a multi-ethnic country which takes a different view of multi-ethnicity and identity. Recently, the French ambassador took exception to a joke by Trevor Noah concerning second-generation immigrant soccer players. The ambassador insisted that African-French soccer players must be one or the other — French or African. My own experience, again, is that such an absolute choice is not really possible, even if they try. Trevor’s comments are here. My hope is that America can continue building bridges of reconciliation between our various cultures here. And if such schemes prove effective, then offer them as options to the rest of the world. It’s not that we’re morally or skillfully superior to other humans, but that we find ourselves in an ideal situation for developing such relationships, in a world where other multi-ethnic societies might not want to do it. To me, this is our calling as a country. Meanwhile, a continuing and regulated immigration into America insures, among other things, a continuing population of second-generation citizens, whose cultural experience can help strengthen our connections with countries around the world to our mutual benefit. Going forward, among other things, we need to regulate a genuine legal path for immigrants to join our society. At present, such paths are mainly only open to elites. The stakes are high, not just for us, but for the world. We will all survive as a species, or none of us will. America has the resources and population to effect a positive difference in that outcome. Human cultures are transmitted and acquired through general human learning processes. So those who understand human cultures, then, gain insight into how many realms of knowledge are acquired. Thus, sports culture, business culture, political culture, academic culture, hunting culture, and many other bodies of knowledge, are expressed and transmitted using the same mechanisms as ethnic cultures. I myself have experienced jazz music culture, particularly the subculture involving academia and “big bands.” So I was interested in the recent movie Whiplash (2014) whose subject is academic jazz big band culture. In fact, the tune Whiplash, performed in the movie, was first recorded by one of my favorite big-band musicians, Don Ellis. Don’s recording of it can be heard here. However, actual jazz musicians found that the story, while well-executed, didn’t reflect jazz culture at all, but sports culture. This just goes to show how distinctive such “cultures” are, since they are easily identified, even when dressed up in the trappings of another. New York bassist Adam Neely presents his detailed analysis of the movie here. A shorter review of the Whiplash trailer by Neely’s colleague, guitarist Rick Beato is here. And since many people can operate in at least two or three domains at once, say Swedish, jazz and sports, plus an ethnic group, they can claim to be, in some sense at least, bicultural or multi-cultural. So, an understanding of cultural transmission mechanisms, given their pervasive uses, can be helpful in promoting learning in many disparate areas of life. For example, most people don’t know that languages are learned best when acquired like a culture. Further afield, disciplines like public relations manipulate customers and voters through the mechanisms of cultural transmission. And in a world where everybody is trying to sell you something all the time, an awareness of their attack methods can be helpful. But all of that is a topic for another time.